We’re not talking bubonic plague here- we’re talking biblical. With 2,227 individual species identified, members of the order Rodentia make up about 40% of all mammal species. The rat and mouse family, Muridae, makes up 700 of those species by itself. 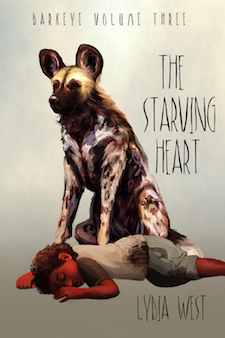 The small-bodied, fast-breeding, gnawing omnivore is clearly a highly successful body plan in almost any environment. Murids have evolved to be opportunistic, taking advantage of resources whenever they find them: if they come across a steady food source, their population can swell exponentially. In nature, there are gradual patterns of feast and famine, especially in seasonal areas, and animal populations naturally go up and down with the availability of food, abundance of predators, etc. In stable environments, this will result in cyclic population patterns. Graph of the cyclic, sometimes dramatic, nature of lemming populations. (Contrary to popular belief, the decreases in population do not occur due to mass lemming suicide.) Source. In especially good years, of course, the populations will go up more than usual. And when conditions are really, really good- well, that’s when things get interesting. Did I say interesting? I meant terrifying. When humans started farming, way back in the day, they started the concept of surplus crop. Not surplus like the buried acorns of a squirrel or an Arctic fox’s dead duckling hoard, no. We’re talking silos of grain. Silos! Hundreds of pounds of grain! Can you imagine the first little mouse seeing those silos and sending a grateful little mouse prayer to mouse god in mouse heaven? Now, for most animals, even a massive surplus of food wouldn’t make the population get too out of hand if it was all clustered in one place. This is because many animals are territorial and intolerant of having too many unfamiliar individuals near them at one time. Indeed, this is even true for most rat and mouse species, as social as they tend to be. If you live in Australia, especially if you come from a farming family, the words “mouse plague” probably mean something to you. Probably something that is not entirely positive. Flash back to 1994. It was a good year for crops; there was an unusually high amount of rainfall, and yields were wonderful. But it wasn’t just wonderful for the farmers- the humble house mouse was celebrating too. Now, these mice are not native to Australia; they were imported along with people. But like many rodent species, they settled in to the relatively placental-free environment, exploiting niches that no native species had yet explored. Farmers were certainly already familiar with the frustrating mouse booms that frequently came hand-in-hand with successful yields. But in 1994, it got ridiculous: the field mouse population swelled to an estimated 500 million. Here is a video about that particular plague, though I will warn that it contains scenes of mild gore, dead animals, and of course an uncomfortable amount of mice. That year mice destroyed 500,000 tons of wheat, or 30% of the country’s crop, costing billions of dollars. Thankfully, it didn’t last long- after a few months, the population eventually burned through the available resources and crashed. 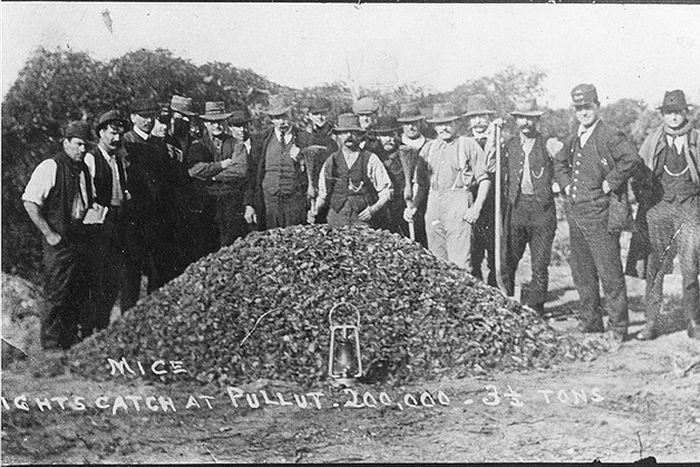 Australian farmers pose behind a massive pile of poisoned mice in 1917. Today, such plagues are rare in places such as the US and most of Europe, but they are common in places such as China and India; anywhere there is a temperate climate with a good chance of heavy seasonal rainfall runs the risk of a rodent plague. 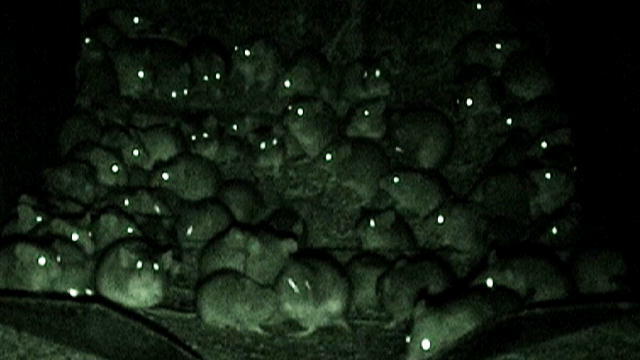 In the video above you can clearly see mice living shoulder-to-shoulder, having to crawl over top of each other, and literally flowing like waves because they are packed so tightly together. How could any animal tolerate these living conditions? As I mentioned before, there is a limit to how much contact even highly social animals will tolerate. 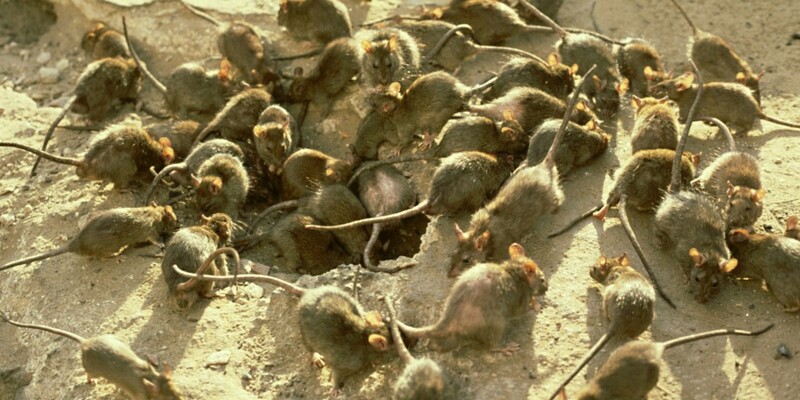 There are a couple of theories floating around as to why these rodent plagues occur. First, they occur most often under specific circumstances: a drought period spanning 1-2 years followed by a significant rainfall. But plagues don’t always occur even when these conditions are met, though their frequency of occurrence is- at least in Australia- actually starting to increase. One of the most interesting theories for why rodent plagues only occur sometimes in seemingly ideal conditions is that rodents have “increase” phenotypes- that is, some mice have a specific set of behavioral traits that can lead to massive population increases, while others have a set of traits that leads to more gradual population increase. If not enough mice with “increase” phenotypes are present in the population, a mouse plague can’t occur even in the best of situations. Interestingly enough, these “increase” phenotypes bear striking similarities to behaviors we select for in our own domesticated animals: increased social tolerance and docility, high reproduction rates, low infanticide rates, low dispersal rates, and low rates of territorial aggression. In other words, a surplus of more “tame” mice in the population might be what triggers these plagues. A population crash occurs when a combination of factors like increased mortality via disease, starvation, predation, etc. and/or an increase of the alternative, more aggressive and territorial phenotype arises. The most terrifying thing about it all is that there is almost nothing we can do if a rodent plague happens. Short of raining poison down on the animals (which the Australian government has done), no amount of traps will get rid of such a horde once it appears. All the farmers can do is wait for the population to crash and hope that they won’t literally be eaten out of house and home. Boonstra, R., Krebs, C. J., & Stenseth, N. C. (1998). Population cycles in small mammals: the problem of explaining the low phase. Ecology, 79(5), 1479-1488. Krebs, C. J., Chitty, D., Singleton, G., & Boonstra, R. (1995). Can changes in social behaviour help to explain house mouse plagues in Australia?. Oikos, 429-434. Mutze, G. J. (1991). Mouse plagues in South Australia cereal-growing areas III. Changes in mouse abundance during plague and non-plague years, and the role of refugia. Wildlife Research, 18(5), 593-603. Saunders, G. R., & Giles, J. R. (1977). A relationship between plagues of the house mouse, Mus musculus (Rodentia: Muridae) and prolonged periods of dry weather in south-eastern Australia. Wildlife Research, 4(3), 241-247. Singleton, G. R., & REDHEAD, T. D. (1990). Structure and biology of house mouse populations that plague irregularly: an evolutionary perspective. Biological Journal of the Linnean Society, 41(1‐3), 285-300. Ylönen, H., Jacob, J., Runcie, M. J., & Singleton, G. R. (2003). Is reproduction of the Australian house mouse (Mus domesticus) constrained by food? A large-scale field experiment. Oecologia, 135(3), 372-377. Previous Creepy Creature: Ghost bats! Tagged animal behavior, creepy creatures, rodentia. « Creepy Creatures #1: Ghost Bats!